Thoroughly blot up as much of the pet stain from your carpet as possible. This is an important step that you want to take seriously. The more you can blot up before putting anything down, the better your results will be. To help with this step; use paper towels, or a clean towel or rag. Fold the towel and place it over the spot or stain. Then, place a heavy book on it, and stand on the book to make sure you really get it all out. This sounds extreme, but it does a good job of transferring the stain from the carpet to the towel. Or, if you don’t have a book to stand on, just stand on the towel for a couple minutes to help absorb the stain. Next, mix 2 cups of white distilled vinegar with 2 cups of lukewarm water in a large bowl. Slowly add in the 4 heaping tablespoons of baking soda. Do this slowly as it will most likely fizz up. If you go slowly, it will not fizz over. Pour this mixture into your spray bottle and thoroughly spray the area. Let sit for 5 minutes, then gently rub and blot up with a soft cloth or towel. If you don’t have a spray bottle, you can pour some of the mixture straight from the bowl onto the stain. Again, let it sit for 5 minutes, then blot up. 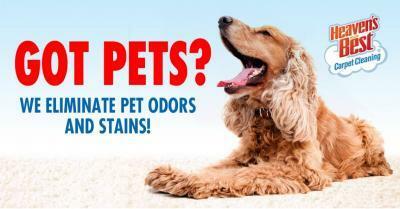 You will be amazed at how well vinegar and baking soda do to neutralize pet stains and odors. Along with being easy, this is probably the least expensive cleaner you can make. Try this Easy Homemade Pet Stain and Odor Remover in Birmingham AL, and if you still need help with pet stains and odors in your carpets, call Heaven’s Best Carpet & Upholstery Cleaning at (205) 618-9150. We have professional strength cleaners that are specially formulated to clean and deodorize pet stains and odors and they work even better than this.